If you're smart about how you organize, you can make do with a very small space. 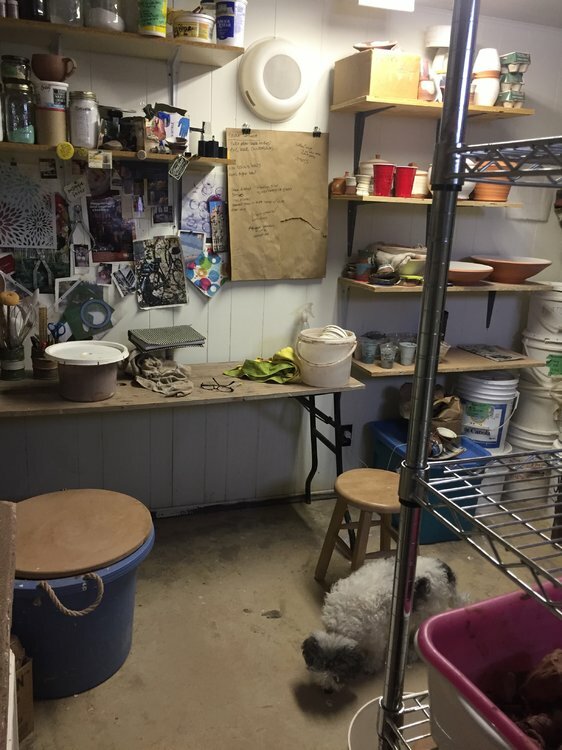 I once had a studio that was 120 sq.ft., and I had two kilns, a kick wheel, all my glaze materials and clay boxes, two work tables, and shelving built onto very wall. It was a great work space. You don't need a lot of open floor space. 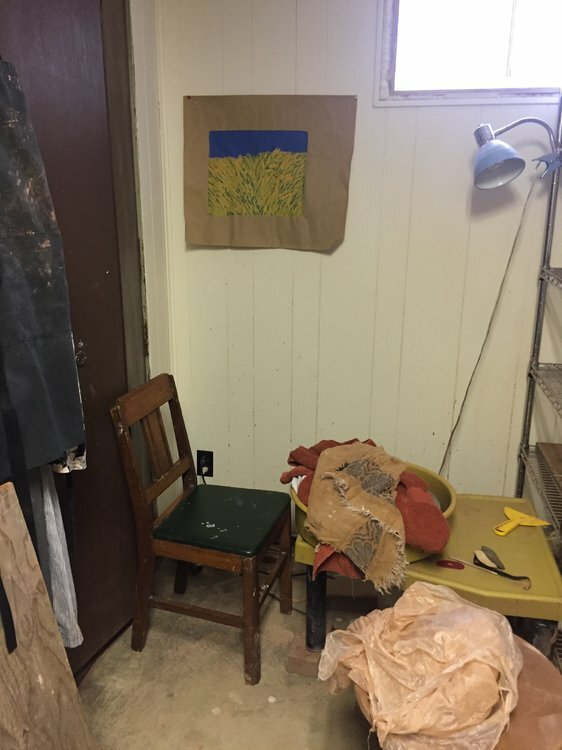 I recently installed a kiln in a studio shed that was about 12x12, which was a very nice work space. hello, deb, welcome to the forums. i have a pretty small studio here. i see you use meters for measurements. so my 10 foot is about 3 meters, i think 16 feet is about 5 meters. i think it is just the right size to hold whatever you would need. 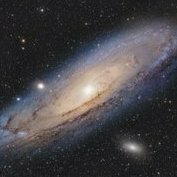 if you look at my gallery, i have posted a series of photos showing it several years ago. naturally, as things evolve while working, it does not look exactly the same today. i have a deep sink that sticks our the side of the building 24 inches, otherwise it is a rectangle. there is a kiln, slab roller, wheel and sink as the basics. lots of shelving that i made or bought from thrift shops or found in the rubbish. after using it for 10 years, there is little that i would change. since it is in florida and i only use it for the winter, i have no central heating. if i needed it, i think i would run heat through the floor. i have that in a bathroom up north and it is a comfortable room. it should not be too expensive for a small studio. 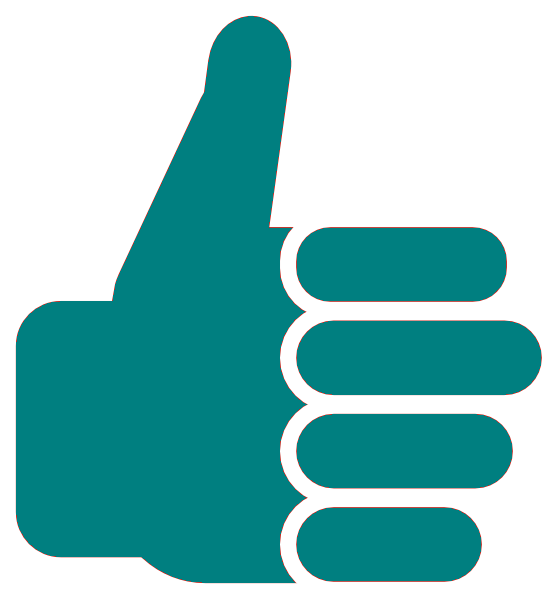 to see it, click on my name, you will go to a page where you can select "profile". under that, find "albums" and look for the series of studio photos. one change i would make is more electrical power and MUCH better lighting. leeU has a studio in a small room in her home. check it out, too. Pres does a lot from a small studio as well. there are several people who work in smaller spaces. i am sure they will add to this thread. forgot the most important thing in studio placement on your property!!!! don't just say "parallel to the house or street is fine". there are probably rules for setbacks. too. first check your local government building office for all the rules. be sure to site it so the natural light is in the correct place for your climate. north should have windows if you are in a hot climate, south facing ones should have shade. check out some architecture books from the library and look at your situation carefully. my big window faces west and gets hot and glaring in the afternoons. it needs an awning to be comfortable. My studio is a dinky little corner of my storage shed. With any luck I'll be adding on to it this year, but it's small. The space I use in it is roughly 6 feet by 6 feet. I save space by putting the kiln outside under my carport, leaving my reclaim outside, etc. I also will pull out folding tables during glaze days and do all of my glazing outside on the folding tables. I think you just find ways to adapt to a smaller work area. I have shelves lining all areas of my shed, added pantry shelving to the walls so I can stack ware boards pretty much everywhere while they're waiting to be bisqued. This summer I will store the glazes outside and put some more pantry shelving on the outside of the shed, because I do run out of space to put greenware. My 7 cu ft kiln is outdoors, and finished product is stored in an adjacent area. I get water from the bathroom across the hall and use a settling bucket system for cleanup water and glaze waste. I can push a LOT of pots out of this room. If you’re not looking to make a living out of a studio this size, you can leave out one or both of the 6’ wire shelves and have space for another work station, or a comfortable studio chair to sit in and think. I have no idea how to find anything by member name or album name in the Gallery, but if you can find me there, I have an album of pics for a studio set-up; a 12x14 space that has full studio functionality. Walking space is narrow but I can walk all around the glazing table to get to the sink, the clay, the drying shelves, the kiln loading shelves, the wedging/work surface table, the wheel and the supplies. The kiln is elsewhere (back porch) and there is no pug mill or extruder. Have fun---setting it up is a blast! Using it, even more so. I feel the ideal size would be about 1/2 the size of any BIG BOX store. That way you can work in a small say 16x16 area and store the rest of your life in the other area. Edited March 12 by Mark C.
lee, i found your photos by clicking on your avatar, finding "albums" and clicking on it. 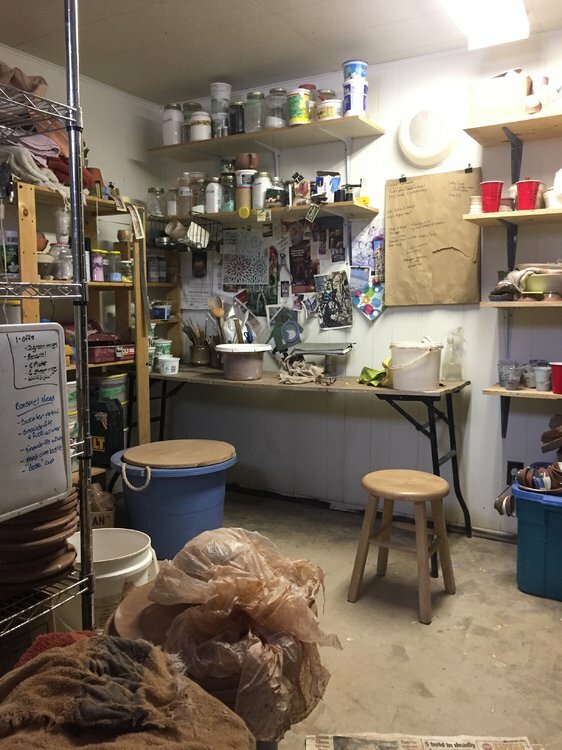 your studio reorganization, lots of pots, etc. 3x3 will fill up fast, I have taken over a little more than half that and it's really tight. No one ever says "I wish my studio was smaller". 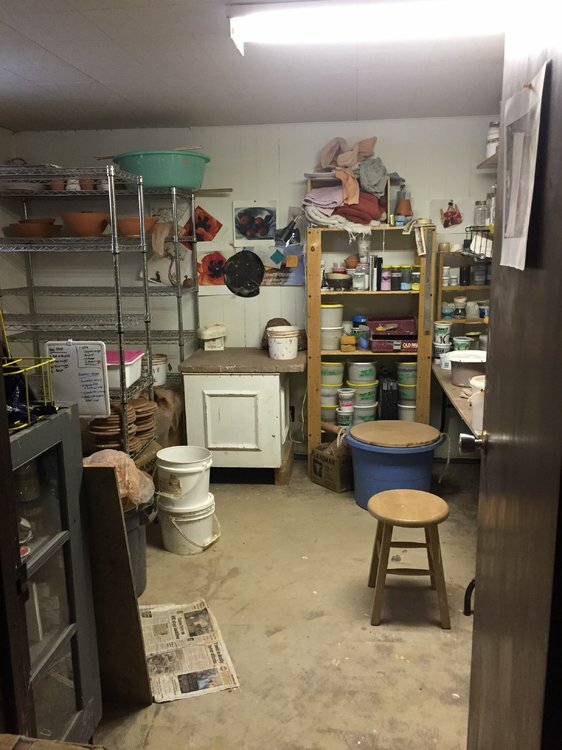 Mine is 12x16 (kiln in a separate building) and it is more than enough space for my small pottery business. I've had larger studios and smaller studios and it seems like whatever space there is gets filled, but I do think there's something very potterly about a small, efficiently used space.